On this site, the Corporation of Hamilton plans to build the new City Hall—as shown in the architect’s plan on this page. 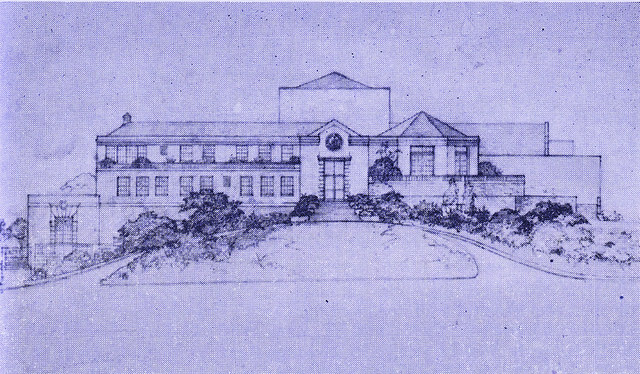 This hall, when completed, will provide adequate housing for the activities of the Corporation, more in keeping with progress of the city than the present City Hall, which is located on Front Street, East. It will provide a Council Chamber, Municipal Offices and an Auditorium seating four hundred persons. The funds for the erection of this building were bequeathed to the Corporation of Hamilton by late Miss Catherine Browne Tucker, who died April 14, 1933, and whose father, the Wor. George Somers Tucker, was for many years a member of the Corporation of Hamilton and Speaker of the House of Assembly. The funds now available for this purpose are in excess of £52,000 sterling.